An internationally celebrated Laboratory, although involved with multiple areas of research, had a specific challenge within the field of clean energy. The Fuels, Engines and Emissions Research Centre participated in an initia­tive for low cost emissions control for advanced combustion engines. As part of this research, they experienced success using Equilibar back pressure regulators to main­tain a continuous and precise flow rate to a catalyst reactor while switching between two separate gas feeds. The feed to the reactor must be switched from Stream A to Stream B without a disruption or surge in flow rate. This is especially critical when the switching times are not equal and gas flow rates are low (the research employs flow rates as low as 20 standard ml/minute). A 4-way valve is used to make a seamless switch between the gas streams. This valve is designed to select one of the two gas streams to feed to the reactor while exhausting or venting the other; however, because the reactor presents a significant pressure drop, it is necessary to maintain the vent stream at the same pressure as the reactor inlet to avoid disruption in flow to the reactor. Exact control is critical: If the vent pressure is lower than the reactor pressure when the valve switches, the flow through the reactor will essentially stop until the pressure builds up enough to flow through the reactor bed. If the vent pres­sure is higher than the reactor pressure, the flow will surge through the reactor. Both of these scenarios are highly undesirable when trying to evaluate and understand the fundamental behaviour of a reaction based on a controlled dose of reactants. To find an optimal strategy to work with the alternat­ing feeds, customer scientists and engineers worked with Equilibar application engineers. 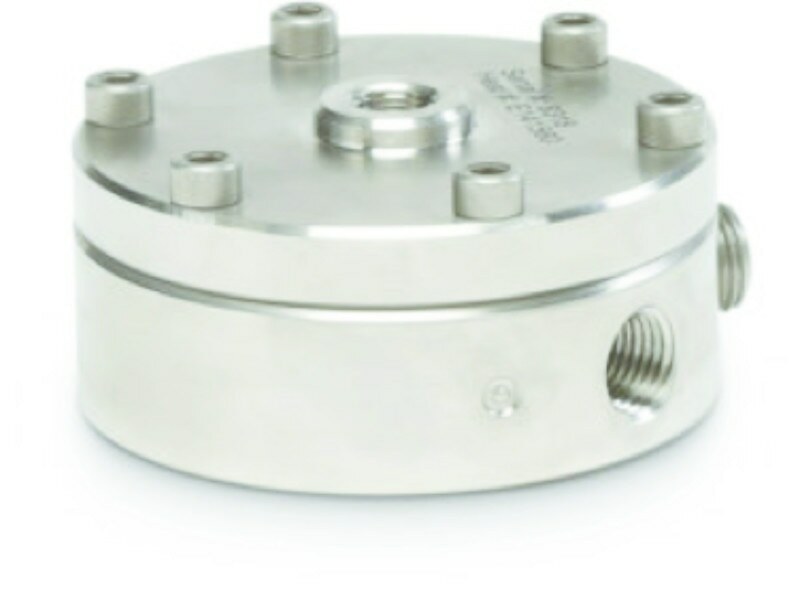 They determined that it was possible to install an Equilibar® precision back pressure regulator on the vent and use the back pressure at the inlet of the reactor as the dome pressure for the Equilibar. 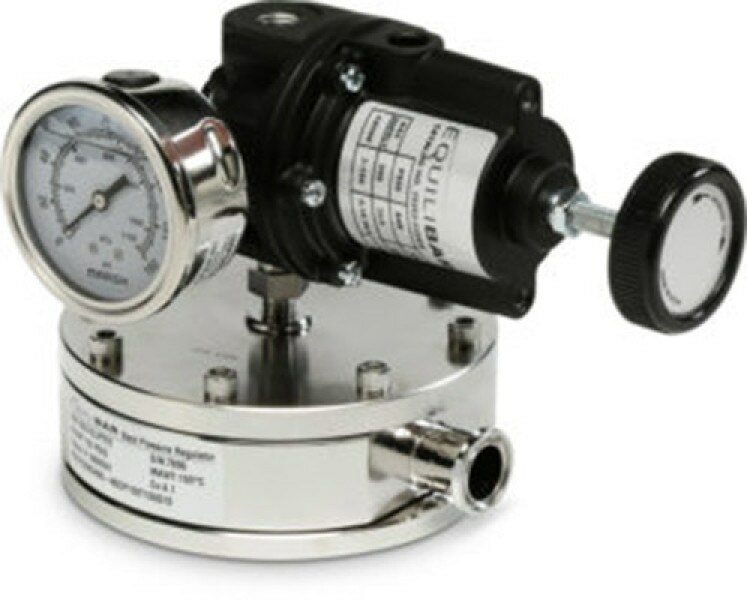 The Equilibar back pressure regulator is dome-loaded with a 1:1 ratio. 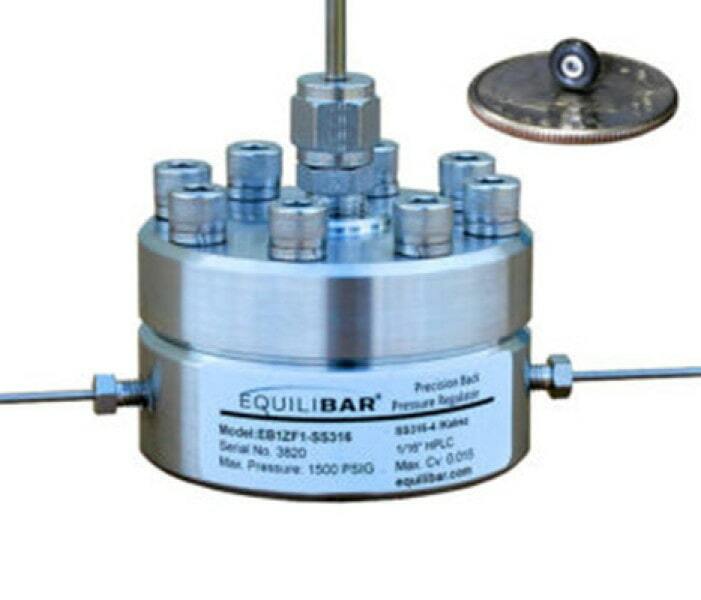 Unlike most traditional regulators, the Equilibar can maintain precision below 1 bar, into the millibar range. In this application, the Equilibar restricts the flow just enough to create equal pressures on both the vent and the reactor sides of the 4-way valve and is thus self-regulating. A key challenge for this application was the combination of low pressure (approximately 0.2 bar gauge) and high tem­perature (190⁰C). Gas flow rates ranged from 20 standard ml/minute up to 5 standard l/minute. 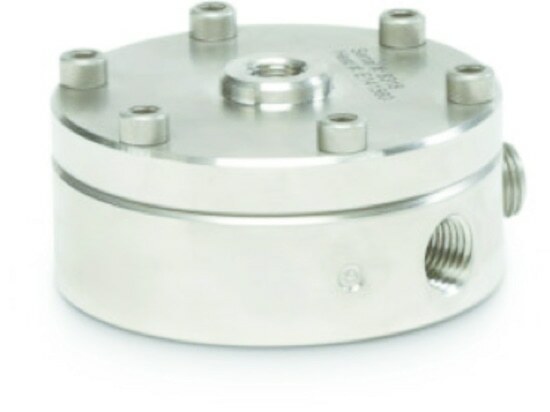 To meet this challenge, Equilibar engineers selected a stainless steel Research Series back pressure regulator, model EB1HF2. Although a PTFE/Glass diaphragm was initially selected, a thin polyimide diaphragm was determined to have the best sensitivity for this application. In this system, the Equilibar plays a key role in automating the reactor under difficult switching conditions. 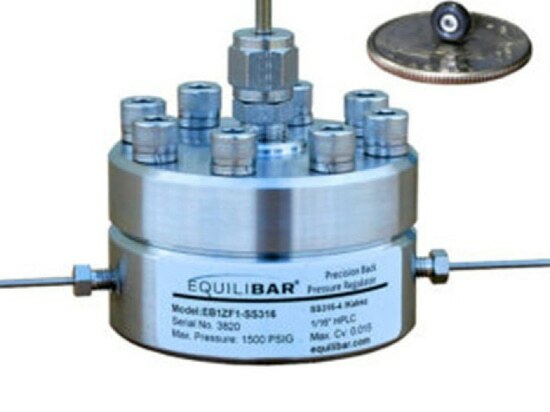 Because the pressure in the reactor increases at high temperatures, the Equilibar is especially useful for temperature ramping/ stepping studies. Without such a self-regulated pressure control system, the reactor operator would need to manually adjust a back- pressure regulator as the temperature was in­creased. 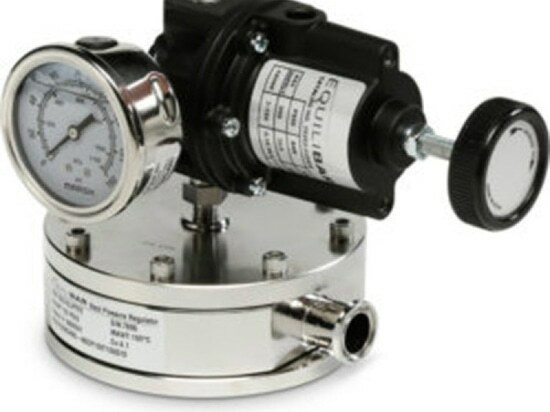 Alternatively, if traditional electronic back pressure regulators were used for automating this pressure balance, it would require two pressure transducers connected to a control system. Such an approach has been shown to have a limited range of functionality in lab settings and certainly would have increased complexity. This innovative application by the customer demonstrates that an Equilibar back pressure regulator can natively maintain pressure equilibrium on both sides of a diverter valve without set-point knobs or complex control systems. The elegant solution helps ensure precision and ease of use for important research into clean energy.